After meeting with the client and discussing budget and expectations we came up with the following brief. It is important to have a mutual understanding of finances. 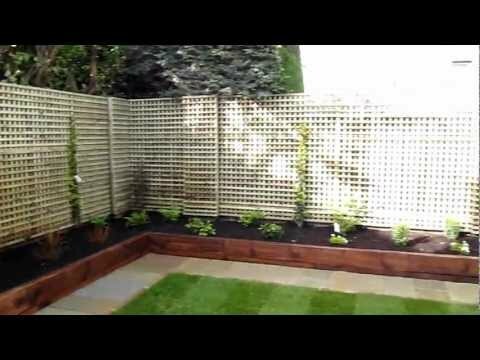 It allows the contractor to choose the correct materials while creating the garden design, it also helps relations when building the garden. For this contract the budget was limited. 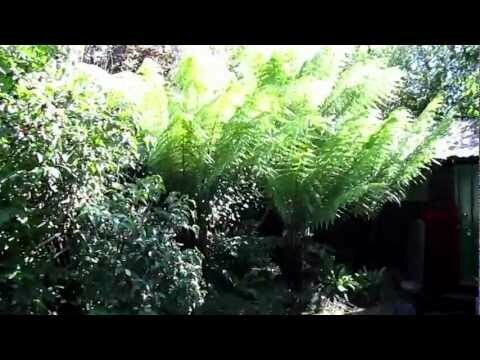 The garden was overgrown and full of weeds, the lawn had 4 tree stumps and was unlevel. 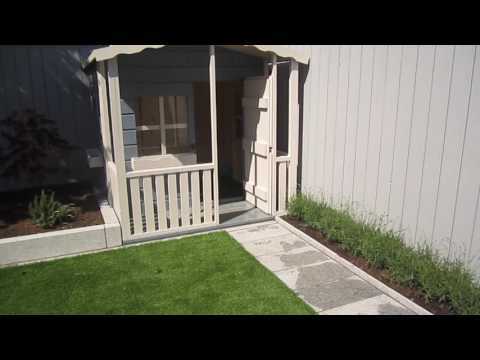 There was an existing concrete patio and path. 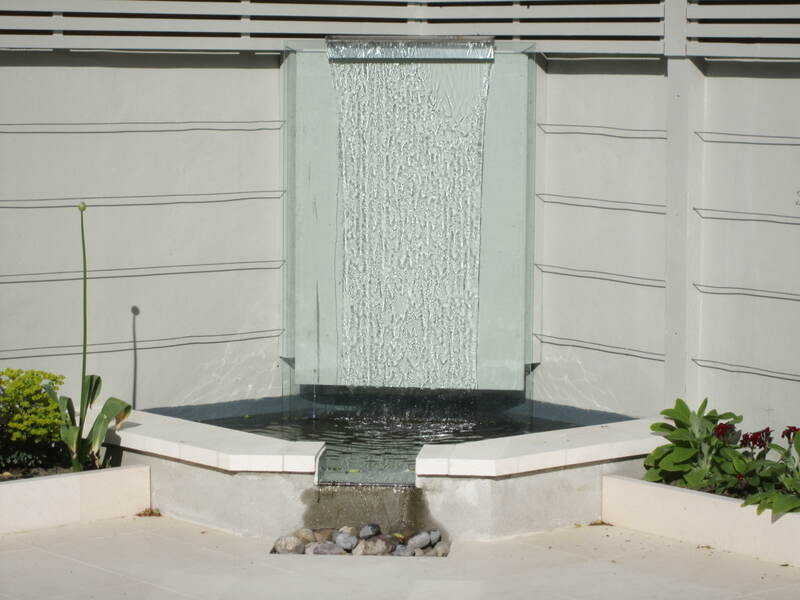 To keep costs down the design was created using the existing structures within the garden as much as possible. 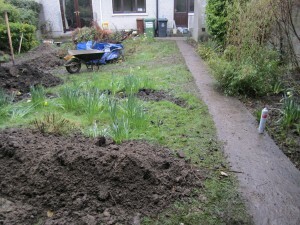 This garden had a bad drainage history so our expert landscapers started by installing mole drains every 1.5M the length of the proposed lawn area. The mole drain is a trench dug 800mm deep, filled with 675mm pea gravel, strips of geotextile are then laid over the pea gravel with the last 125mm filled with topsoil. 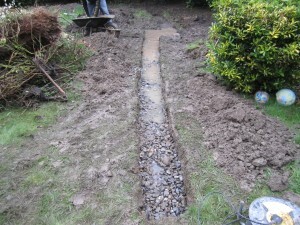 The drains allow fast percolation of water and also act as large soakaways during spells of heavy rain. Our landscapers started by laying the Cota brown limestone patio. The slabs were laid with a 3:1 sand and cement mix directly on the existing concrete as the DPC was high enough. 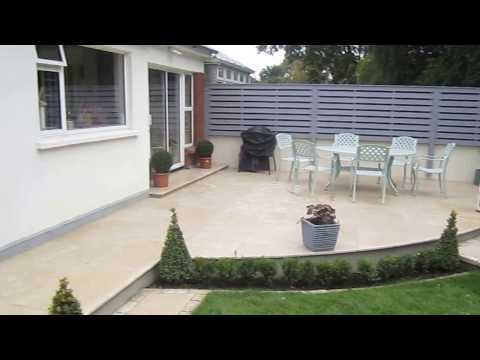 The Limestone patio extended into the garden giving a good sized seating area. When laying a patio on existing structures always allow 125mm below the DPC. The path was then installed using 600x300mm slabs again laid directly on existing concrete path. 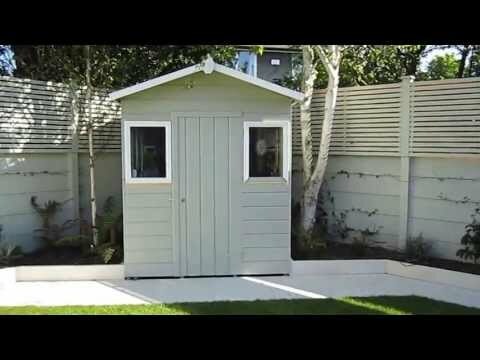 Like most landscaping contracts the client had 3 wheelie bins which needed an area beside the house but out of site, a paved area was created behind an existing shed. At the end of the path we installed a foundation for the proposed wendy house. Next our landscapers installed the mowing edge. 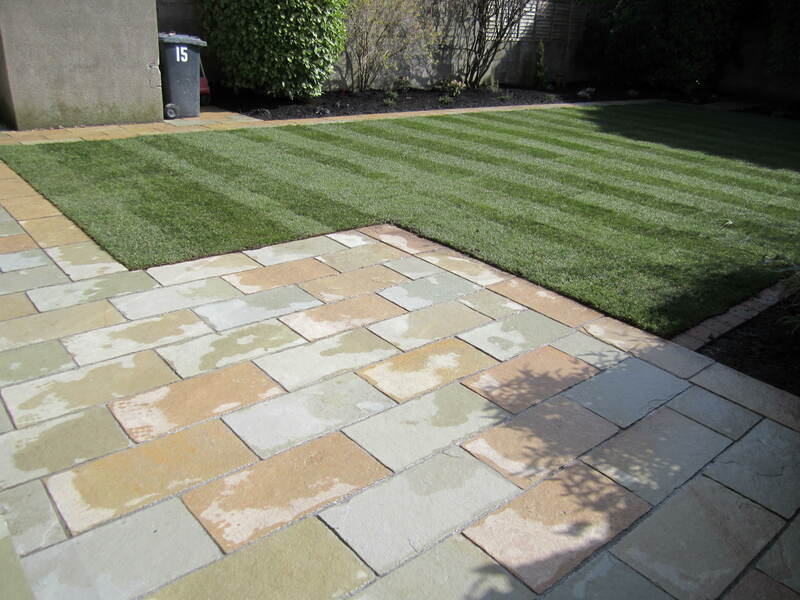 The mowing edge consisted of Tegula bracken paviors laid on a 50mm bed of 3:1 sand and cement mix. The mowing edge is important as it insures a solid edge to the flower beds, it also gives definition to a space and reduces maintenance. 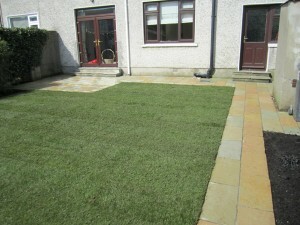 For the lawn we started by importing 4 tonnes of screened topsoil mixed with sand, to bring up levels and create a good bed for the roll out turf. When laying the turf we insured a tight fit between sods which were then tamped to create good contact with the soil beneath. After the sod was laid the whole area was saturated with water. All traffic should be kept off the newly laid lawn for at least 3 weeks to insure healthy root growth. Planting of the beds came next. The plants chosen were a hardy mix of trees, shrubs, perennials and climbers. The trees were the Sorbus variety, these are native to Ireland and will encourage wildlife in the garden, they also display flowers, berries and autumn colour. The perennials included Heuchera, Dryopteris, Bergenia, Pulmonaria, and Peaonia. The shrubs consisted of Diosma, Dodonea, Skimmia, Euonymus, Epimedium, Libertia, Astelia, and Phormium and the climbers were a variegated variety of Hedera. All the plants were then well watered. To reduce maintenance the plants were surrounded by a layer of geotextile matting, the matting was then covered with a 75mm layer of bark mulch. The bark mulch gives a lovely finish to the beds and also helps to retain moisture, keeping the plants healthy. The client was very happy with the results and the project came within budget. 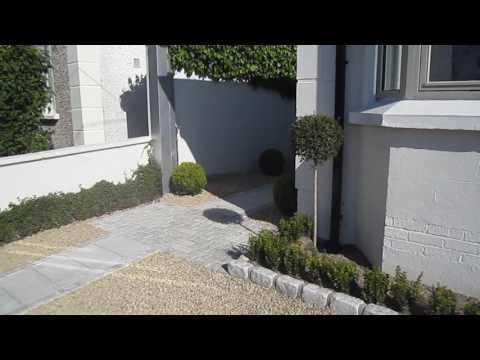 If you like what you see and require a professional landscaping service, contact Kevin Baumann on 086 8198444.